In this guide we will do doing a saddle soap vs mink oil comparison and explaining the differences between the two leather products. We often see some confusion with the use of saddle soap and mink oil with the two products being used interchangeably. 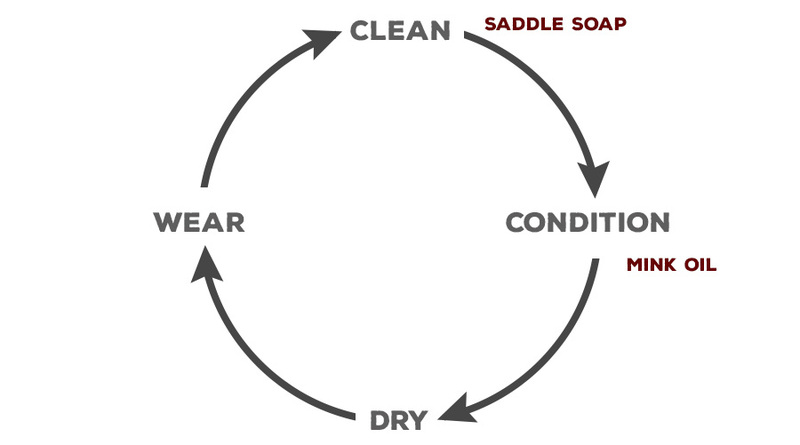 The truth is saddle soap and mink oil serve two different purposes. This short guide has leather boots and shoes in mind but also applies to other leather goods that need to be routinely cleaned and conditioned. Saddle Soap is primarily a leather cleaner that lightly conditions leather while mink oil is a leather conditioner with waterproofing properties that does not clean leather. Saddle Soap is usually the first step in the leather cleaning and conditioning process as it’s primary purpose is one of a cleaner or “soap”. As a stand-alone conditioner it's not enough to fully condition your leather and prevent it from future harm. Only using Mink Oil without first cleaning your leather can have disastrous results such as uneven darkening or streaking from dirt being trapped under the layer of applied mink oil. If you want all of the details of when and when not to use mink oil please check out our What is Mink Oil? guide. The suggested course is to clean your leather with saddle soap and then condition them with mink oil. Both products together do a great job at cleaning, hydrating and adding life back into your leathers. We recommend pairing Feibing's Saddle Soap and Mink Oil. But just about any pair will do as long as it's a high quality product. Saddle Soap and Mink oil are for smooth leathers only. Avoid use on suede, nubuck or rough out leathers. Saddle soap and mink oil are best used with hardwearing leathers such as those in work boots, hiking boots, and winter boots. What is mink oil? And should you use mink oil on boots? We explore the do's and don'ts of mink oil in this helpful guide.